Customer Relationship Management software (CRMs) still remain a hotly debated topic amongst Australian businesses. Should you invest now, or is it a passing trend? But hearing statistics like ‘a CRM can increase revenue by 41% per salesperson’ and ‘on average CRMs deliver a return of $8.70 for every $1 spent’* makes you wonder why so many businesses are missing out on the benefits of a CRM. While it’s no doubt that a CRM is vital for any business serious about growth, it’s true that most CRM implementations go wrong. While working with many SMEs in Australia and NZ, I’ve had the chance to observe many of the mistakes they’ve made first hand – and been there to help them out of some. If you’re thinking of implementing a CRM, here are 4 CRM mistakes to avoid making. It’s called customer relationship management software, but businesses often forget the actual users of the system – their sales team. 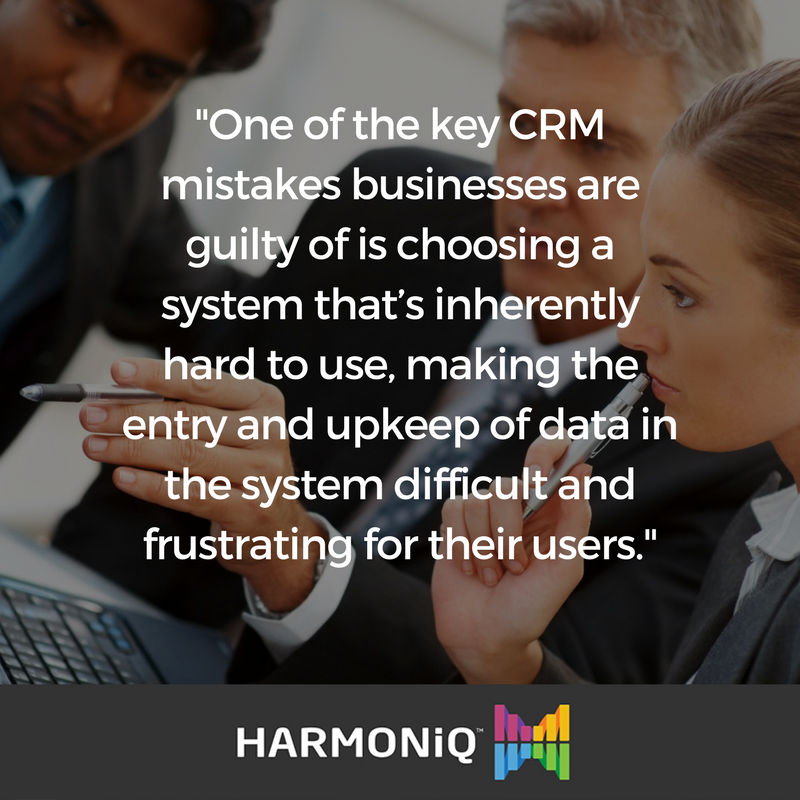 One of the key CRM mistakes businesses are guilty of is choosing a system that’s inherently hard to use, or making the entry and upkeep of data in the system difficult and frustrating for their users. Choose a CRM that’s built for ease, with functionality that’s irresistible for your salesforce. While a great interface and useability are necessary, user-adoption also depends on how easily it fits into your optimal processes. Some CRMs force users to enter superfluous data they don’t need. 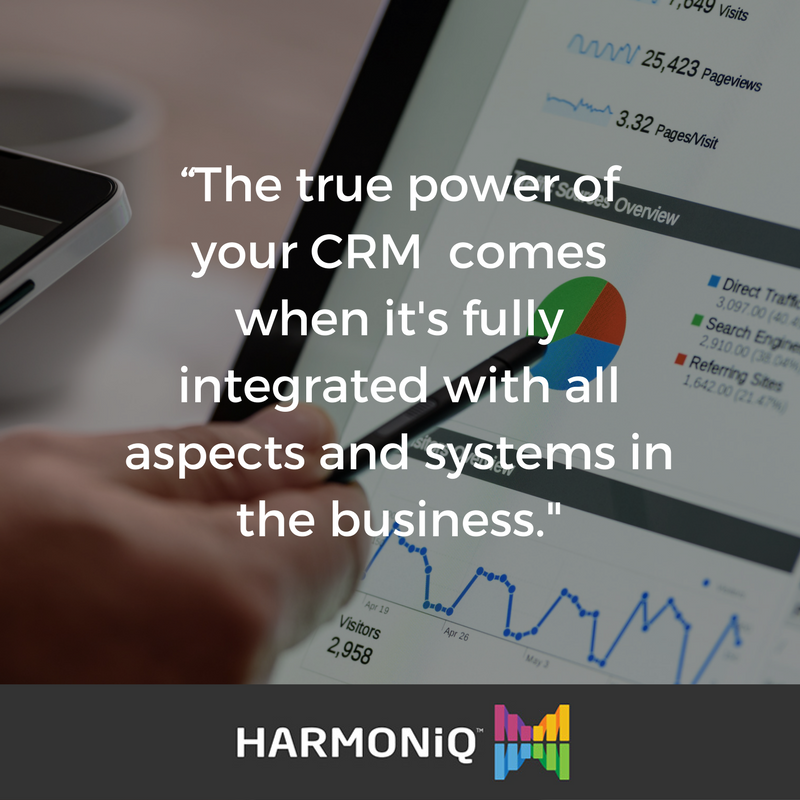 A CRM like HARMONiQ can be easily configured to adapt to how your staff works. So for example, if your staff prefer minimal fields and a bare dashboard with just the assigned tasks for the week – that can easily be customised for your users. Most business owners would know that it’s not enough to just install a CRM, give staff a log-in, and expect them to start using it religiously. What’s really needed is to train staff exactly what to do with all the functionality that is now at their fingertips. Show your sales team how to use the data to close more deals, identify an opportunity that’s slipping away, and ensure they never miss a meeting or call. Show your managers how to use the data to coach their employees more effectively. At HARMONiQ, we run user workshops as part of our implementation process. This ensures we get an understanding of the critical processes for the business, and the staff get visibility of what the system can achieve for them. We’ll then usually start by automating all the tasks the sales-team don’t want to do, or forget to do – like quote follow-ups, or ‘getting back in touch’ emails. We can also set up custom reports, workflows and dashboards to communicate the business critical information relevant to each user. Another one of the common CRM mistakes is looking at a CRM as one big upfront cost. It’s true, implementing a custom CRM is not cheap. 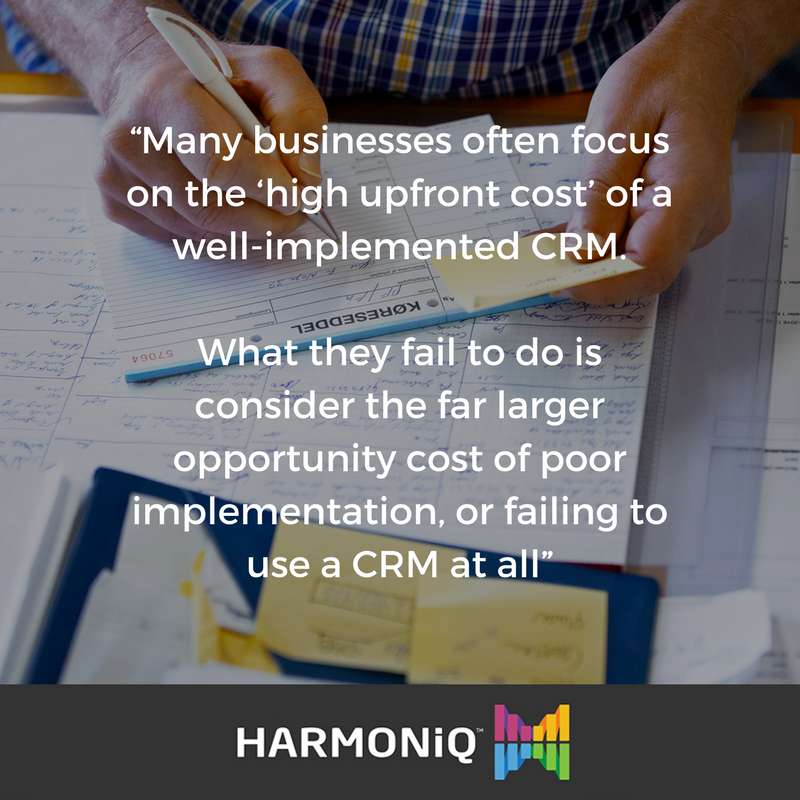 But what many businesses fail to do is look at the opportunity cost of not implementing a CRM. I like to call this the ‘locked-up value’ of a business, for which a CRM is the key. One of our customers, who was then still considering HARMONiQ, shared with me that the total value of all the quotes his sales team forgot to follow-up was over $1 million a year! A dollar value that could easily be sent directly to his bottom line with the right CRM features. Isn’t this a problem you would invest to fix? Automating quote follow-up is one of the most popular customisations we include in our HARMONiQ implementations, but everything from replenishment orders, supplier follow-up, and more can be easily automated to save you millions in ‘locked-up’ costs. A lot of businesses purchase a CRM as an add-on system for their sales or marketing teams to use. What they don’t realise is that they could be doubling or tripling the work their staff have to do. A CRM that’s isolated from other systems in the business – like accounting or inventory – eventually becomes inaccurate. Unless you employ staff to manually update every record every time they make an order, or lodge a complaint, the data stored in your CRM becomes just a list of names. The true power of a CRM comes when it’s fully integrated with all aspects of your business software. That’s when it becomes the one source of truth for your business, and is able to perform advanced forecasting and more accurate reporting – to help support your decisions. An all-in-one solution like HARMONiQ will cover all aspects of your business, with one integrated platform for financials, inventory, sales, and marketing. As you know, HARMONiQ is a powerful new platform brought to you by Micronet Systems, with plenty of in-built automation to really revolutionise the way you do things. If you’d like to find out how Australian and New Zealand businesses are using HARMONiQ CRM to achieve additional process automation – let me know. I’ll organise a quick demo to show you some of the great things HARMONiQ can do for your business.